Sadly, the development of pressure sores during an admission to a nursing home has become a way of life at some facilities. Despite their prevalence, they are simply not a consequence of ‘old age’. Rather, the majority of circumstances where a patient develops a pressure sore during a nursing home admission is a result of the facilities inattention to the individuals’ care needs. Rosenfeld Injury Lawyers LLC represents Chicago nursing home patients who have developed bed sores during an admission. Our attorneys have had success prosecuting nursing home bed sore cases involving skilled nursing facilities across Illinois. 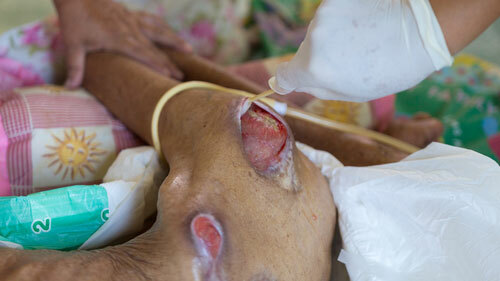 Several our cases have resulted in seven figure recoveries from nursing homes where the wounds originated. If you are concerned about a loved one's bed sore at a nursing facility, contact our office for a free case review. This can be attributed to either just poor care or neglect, or the facility is understaffed to the point where nursing staff is unable to handle the workload. Either way, these residents deserve better treatment from those who are paid to care for them. Their have been estimates of up to 90% of nursing homes are under-staffed. The prevention and treatment of pressure sores during admission to nursing homes is not just humane, it is also the law! In 1987, Congress passed The Omnibus Budget Reconciliation Act (OBRA) with the intention of protecting nursing home patients from inferior care and neglect. In exchange for acceptance of Medicare funding (which funds over 90% of nursing homes), facilities must implement and comply with federal regulations pertaining to the development of pressure sores at their facilities. Even with these clearly delineated responsibilities, nursing home patients are at risk for developing pressure sores due to facilities inadequate care. Today, many nursing homes have elected to put their corporate profits over the care of their patients. Under-staffing and inadequate training has become rampant in the industry. Considering that most pressure sores can be prevented, it is abhorrent that so many nursing home residents suffer from this condition. According to the Center for Disease Control, more than 1 out of 10 nursing home patients have a pressure sores, an estimated 11%. The majority of these are Stage 2 pressure sores, which means the sore has generally broken the skin and has progressed from the early stages of the ulcer. 30% of the sores are a Stage 3 or higher, putting the resident at risk of other medical and health concerns. Rosenfeld Injury Lawyers LLC has successfully prosecuted cases involving the development of pressure sores during Chicago nursing home admissions and is well versed in using all applicable state and federal laws to prosecute our clients cases. If your loved one developed a pressure sore during an admission to a nursing home, there is a good chance the facilities negligent care may have contributed to the situation. Our Chicago bed sore attorneys are experienced in prosecuting these cases for maximum value in the most expeditious manner possible. The successful prosecution a nursing home negligence lawsuit involving a patient who developed pressure sores during an admission to a facility is dependent upon obtaining information specific to how a nursing home is operated and the policies in place to identify and treat pressure sores. Here are some discovery requests that our office has successfully used in the prosecution of bed sore lawsuits involving nursing homes.